I would like to congratulate the CCPIT on the relocation and opening of its London Office. As you may know, we Chinese tend to be very meticulous about neighbourhood when we choose location of our homes and offices. I'm glad to say that there is no better choice than the location of this new Office, since it is in the heart of the financial capital and is flanked by the Guild Hall on the left and the Bank of England on the right. The CCPIT London Office has played an important role in promoting business cooperation between China and the UK since it was set up in 1989. It has worked hard to engage with the UK business community and facilitate communication and cooperation between the two sides. It has established a strategic partnership with the British Chamber of Commerce, co-hosted major events such as Tell You the Truth About "Made-in-China" and the UK-China Business Summit, and assisted in "Road to London" events in 11 Chinese cities. 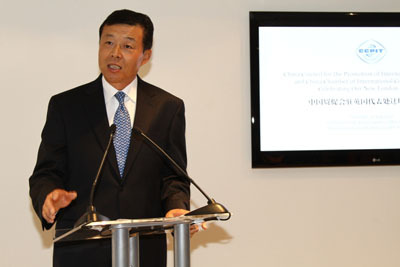 The Office has also expanded five times its services for Chinese companies in the UK. Over the past two decades and more, the business ties between China and the UK have undergone a big transformation from simple trade to all-dimensional cooperation that covers trade, investment, technology transfer and joint research and development. They have become an important pillar of China-UK partnership, benefiting both countries economically and promoting the mutual understanding and friendship between our two peoples. Not surprisingly, both governments attach great importance to expanding this mutually beneficial relationship. President Hu Jintao and Prime Minister Cameron had a constructive meeting during the G20 Summit in Toronto last Saturday and reached a consensus on the development of our relations in general and the need to strengthen our business partnership in particular. Thanks to the thoughtful arrangements of UKTI and CBBC, I visited the Midlands and Northwest England last week to learn more about UK industry and explore possible areas for closer cooperation. The visit has impressed upon me the great potential and promise of our cooperation. First, there are still great potentials for increasing trade and many opportunities for expanding economic cooperation between our two countries. Our two-way trade was 39.1 billion US dollars in 2009, taking up merely 1.7% of China's total trade and less than 4% of that of the UK. Second, the two economies have a lot to offer each other. The UK has a leading edge in high-tech industries such as aviation, automobiles, bio-medicine, clean energy and service sectors such as financial services and the creative industry, while China is a leading manufacturing power in the world. We will both be better off by complementing each other's strength. Third, both governments are keen to expand investment. More and more Chinese and UK businesses are thinking about investing in each other's country. China is working hard to expand domestic demand, encouraging more consumption and expanding market access to foreign businesses, while the British government is trying hard to export more to China. This has offered more opportunities for profitable investment both ways. Fourth, our business relationship enjoys a positive long-term outlook. As the world economy recovers from the crisis, people are more willing to spend and trade will grow again. China's booming economy means greater purchasing power of its people. Inexpensive yet quality goods made in China will help keep inflation low while supplying the needs of the British people. All in all, through hard work and cooperation, I'm confident about the success of the CCPIT London office; I am even more confident about the bright future for business partnership between our two countries.